The original Japanese ”Guinea Pig” series is regarded as a landmark achievement of extreme cinema, famously receiving notoriety after Charlie Sheen reported Flowers of Flesh & Blood (1985) to the FBI in 1991 because he was convinced that it was a real snuff film. This led to an investigation, with the creators going on trial and having to prove that the atrocities being committed on screen were indeed fake. Suffice to say, the film is now regarded as a cult classic as a result; if Federal authorities get involved, then your movie has achieved its goal. 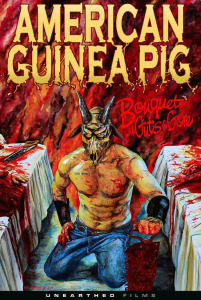 ”American Guinea Pig: Bouquet of Guts & Gore” is the modern American reboot of the series, directed by first timer Stephen Biro, founder of Unearthed Films, a company which specializes in distributing movies made with the intention of making viewers physically sick. From the moment I heard about this movie, I was intrigued: These type of films aren’t usually my cup of tea by any means, but the hype surrounding ”Bouquet of Guts & Gore” was too great to ignore. Deemed by many reviewers as the most unpleasant experience they have ever had to endure – in the good way, not the Adam Sandler way – I just had to check it out to see if it would break my threshold. Unfortunately, it didn’t make me vomit; I’m the type of guy who can watch human beings getting butchered and not flinch, then go ball my eyes out watching ”Marley & Me.” However, ”Bouquet of Guts & Gore” impressed me as a visual spectacle: I was in awe at the gore FX, as opposed to sickened like many people will be. However, I was entertained for the duration, even though it’s not a movie anybody in their right mind would describe as ”entertaining.” Thankfully, I’m not in my right mind. Essentially, ”Bouquet of Guts & Gore” is the abduction, drugging, dismemberment and disembowelment of 2 females while a film crew record the vile acts. It’s a faux snuff film with not much in the way of story or character development. Shot on 16mm, it’s looks grainy and homemade; and is so unrelentingly cruel and mean spirited it’s sure to test the metal of most viewers. There’s an audience for this type of film and anybody who watches it knows what they’re getting themselves into. Enter at your own risk, because the butchering that takes place on screen is as authentic looking as you’re likely to see, outside of… you know… actual murder. For me, the lack of attachment to the victims made it difficult to sympathize with their plight. It’s very rare a film will make me feel sick or disturbed, so in those regards, ”Bouquet of Guts & Gore” didn’t succeed. However, it will make a lot of viewers feel rotten to their core and in desperate need of a shower afterwards. For gore lovers like me, they’ll sit and marvel at the FX courtesy of Marcus Koch, who, in my opinion, is the absolute best FX artist working in horror right now. The score is another highlight of the film which will give viewers feelings of unease. Orchestrated by Jimmy Screamerclaus, the weirdo genius behind psychotic fever dream ”Where The Dead Go To Die (2013)”, the ominous doomscape is sure to creep into the nerves of many a viewer and remain with them long after, when they replay the heinous acts they just witnessed over again in their head. ”American Guinea Pig: Bouquet of Guts & Gore” isn’t a movie I recommend, due to its content. It was made for a particular group of horror fan; the ones who openly bask in the nasty pleasures of the abyss. If you’re a fan of extreme, transgressive cinema of this nature then you’ve probably seen it already – or will soon. However, for a guy like me, who isn’t a fan of pseudo snuff films usually, I wasn’t bored for a minute and it’s definitely a stand out little nasty I won’t forget anytime soon. I can’t say I was blown away by it – minus the outstanding gore – but I was entertained for 72 minutes and I have no doubt it’ll be regarded as a classic of its kind, much like its predecessors. Stephen Biro is a successful Jack of All Trades, and he can add director to his list of talents. Overall, this is a movie that will offend people and undoubtedly get banned in many countries, but it accomplishes what it sets out to do and deserves plaudits. 7/10. Fun fact: Biro named the victims after his ex-wives. I thought that was funny.